Or, how I spent my Christmas vacation. "I know this is what you've been looking forward to," said Dan Reed's mom, newly-appointed director of the Lego City Department of Transportation, as the twentysomething graduate student assembled the bright blue tram. "Look at him playing with his toys." The new streetcar running down Brick Street in Lego City. 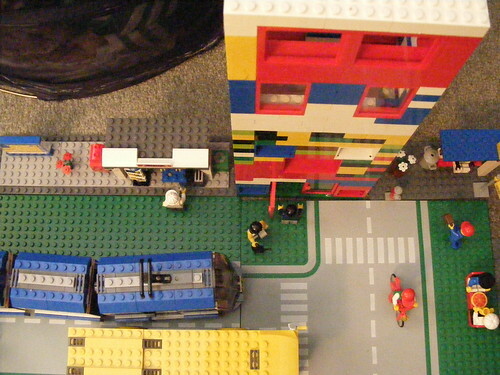 Nowhere are the effects of the new streetcar more evident than the Brick Street corridor, located near Lego City's main Public Transport Station. Since the trams started running Christmas Day, a skateboard shop, coffeehouse and gourmet pizzeria have opened. 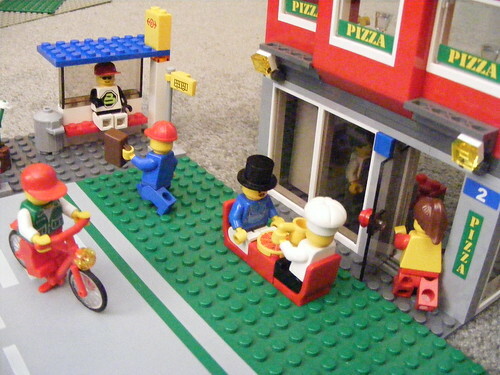 Hip minifigures sip wine in sidewalk cafes as bright young toys on red bikes click by. Massive new condominiums built from Duplo blocks tower over the neighborhood's iconic, multi-colored rowhouses. New resident Ashley Lyman outside a coffeeshop on Brick Street. Ashley Lyman just moved to Brick Street and says her favorite part of the neighborhood is the activity. "I used to live in [suburban] Blockville and just sit in my big, pink house after dark," she says. "Here, there's always something happening! 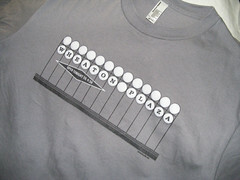 And I'm embarrassed to say it, but I hear [big-box retailer] Blockmart is moving in and I can't wait." 60-year-old Sarah Belk earned her nickname "the Mayor" for starting a neighborhood watch on Brick Street during the 1980's. "I've been a street sweeper, a doctor, and a pirate, but my taxes are so high, every brick I make goes right out the door again," she says. "What good is this new stuff for me? 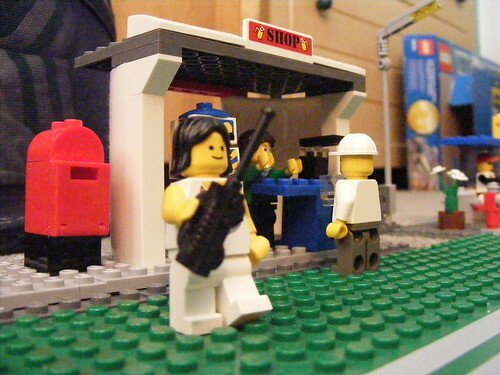 Lego City is trying to run us hard-working people out of here." Minifigures enjoy the vibrant sidewalks of a revitalized Brick Street. Henry Floyd, columnist for the Lego City Post and a resident of Brick Street, is opposed to the streetcar. He says the overhead arms and hands that power the tram ruins the area's "historic" viewsheds, but more importantly, that the entire project is a waste of money. "There are lots of ways to get around Lego City, but we can't all give them each their own lane," he says. "What's next? A lane for horses? For helicopters and boats and spaceships?" "Kids in Lego City are being failed by our nonexistent public schools," he adds. "When is Dan's mom gonna buy him something useful, like a police station set?" New condos tower over Brick Street's historic buildings. Some hope that minifigures on Brick Street will finally click the old and new together. Local blogger Alex Block has lived there for five years, rehabbing old houses covered in childish crayon graffiti. 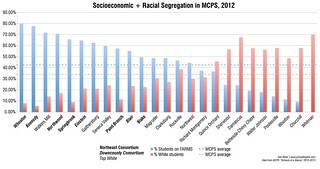 "People like to focus on our differences," he says. "Some of us carry around giant phones. Some of us wear race car helmets. Some of us don't have eyebrows or noses. But we're all yellow and plastic on the inside." 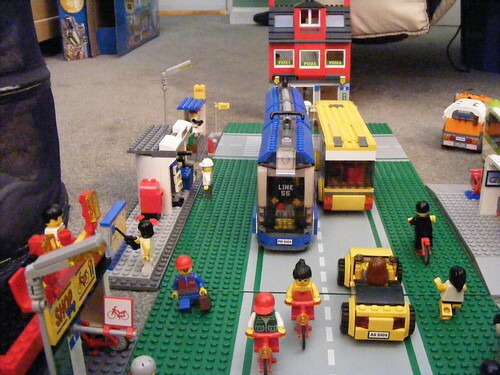 See more of the streetcar and Lego City in this photoset. Why are there no photographers in Brick City??? You got a problem with that? This further inspires my efforts to build a lego Purple Line model. I'd actually done one up for one of Dad's parties when I was still in elementary school, although I think it had a boxcar as that was the power source available at the time. I love Brick City. It tickles me yellow!